After receiving complaints about their emojis’ lack of diversity, the new version of Apple’s iOS X operating system will pave the way for racially diverse “People” emojis to become available in six shades. Currently on trial, the tech giant is still putting the finishing touches up on the rollout as the development hunkers down in beta stage. Working with the Unicode Consortium, the group that standardizes emojis, in the final product you’ll be offered a dropdown menu of skin tones by clicking and holding a picture. 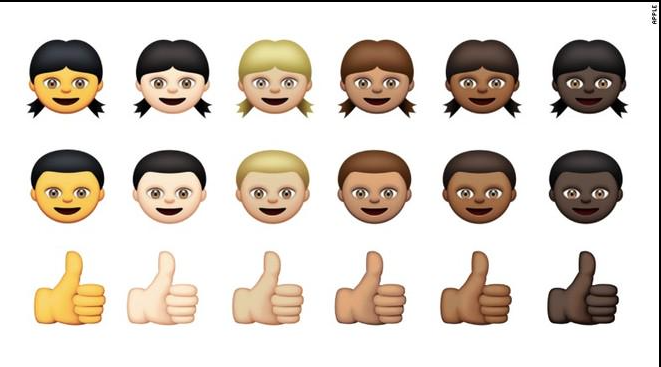 In addition to being able to alter ethnicity, the new update will include more country flags and a watch emoji of the iPhone 6. This entry was posted in Gossip and tagged Apple, Diversity, Emojis, Iphone. Bookmark the permalink.